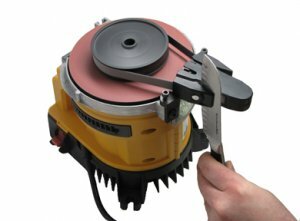 The Work Sharp sharpening system has been a good option for anyone looking for a powered sharpening system on a budget. We usually don't think of $100 as a budget price, but when the competition is selling for $350 - $600, $100 is a great price. One of the things the Work Sharp system was missing that the competition has, is the ability to sharpen knives. This is a problem no more with the addition the the Sharpening attachment for the WS2000. For around $35 the knife attachment uses abrasive belts up to 3600 grit to get your knives nice and sharp. They even say it will sharpen serrated knives. I hope we can see a knife attachment soon for the WS3000; we don't want to see anyone left out.